Hascall took on the project at PNB in 1983, and subsequently was hired on permanently. When PNB’s then-costume shop manager, Mark Zappone, left for Europe a few years later, the company promoted her to fill his shoes. She’s worn them ever since. Russell and Stowell decided to embark on new sets and costumes for George Balanchine’s “A Midsummer’s Night Dream” in 1997. The founding PNB directors brought this ballet into the company’s repertory in 1985, and during the next decade the Balanchine Trust gave them permission to redesign it. They chose Tony-award winning designer Martin Pakledinaz to design both the sets and costumes. 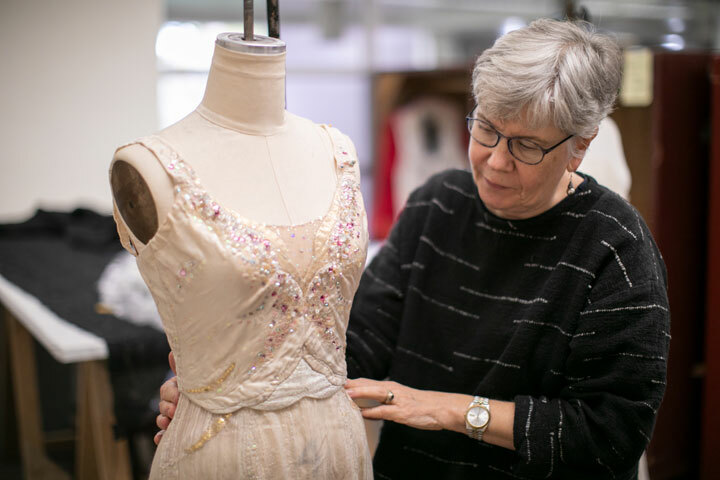 Hascall led her shop in creating all new costumes for a cast that required the whole company, as well as students from PNB school — 126 roles in total. Hascall has fond memories of Pakledinaz and working with him on this production. Hascall had also worked with him on Kent Stowell’s “Cinderella” in 1994. The next season at PNB (1997-98) was its 25th anniversary, and also Hascall’s most challenging. Not only was she managing the costume shop, she was also designing costumes at the time. And Stowell and Russell had programmed all new ballets — 15 of them. There have been other busy times since then, but nothing quite approached costuming 15 new ballets over nine months for PNB’s silver anniversary season, Hascall said. With just two more programs this season, she is looking forward to what’s to come in retirement. She and her husband, who’s also now retired, became grandparents last December, so babysitting is on her list of priorities. Hascall is also interested in volunteering with nonprofit organizations in her neighborhood, such as Woodland Park Zoo. There hasn’t been time for this given a busy work life. Hascall will be missed at PNB, but her enormous legacy will dance on. Join Hascall and PNB audience education manager Doug Fullington for a conversation about Martin Pakledinaz’ scenic design and costumes at 5:30 p.m. Thursday, April 11. Attend the hour-long discussion only or also stay for the dress rehearsal. Tickets can be purchased through the PNB Box Office at -206-441-2424. “A Midsummer Night’s Dream” runs April 12-21 at McCaw Hall.